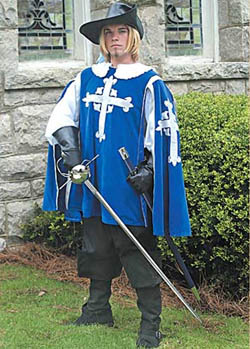 The very picture of French chivalry - our musketeer tabard is made from a royal blue cotton velvet and fully lined in matching satin. The front and the hanging sleeves are embroidered with the silver cross fleury of the order, and the edges are trimmed out in a matching silver trim. The generous single size allows for plenty of freedom of movement, but if needed, a size XXL is available for $5.00 more.